Blackheads. Who has not had them, and who does not hate them? Actually, I get more whiteheads than blackheads, being acne-prone. But I do hate those blackhead removing devices they have in salons. The metallic ones that scrape off the sides of your nose, making you think you are undergoing rhinoplasty, without anesthesia. Why do so many beauty devices look like torture devices and cause pain? I have not been to a salon for one and a half years now - not since April 2013 - so I wanted to a get a box that would let me do my own blackhead-eradication at home. 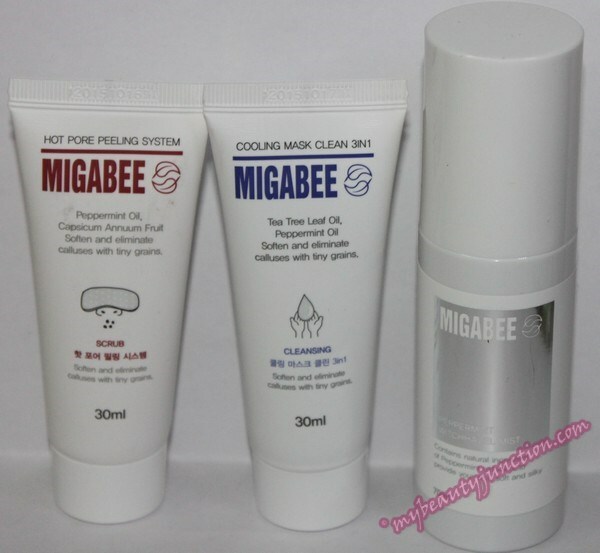 Superbox 63 Blackheads No More, from Memebox, promised to contain blackhead removing, preventing and minimising products and Memebox said the box would make dealing with blackheads a breeze, without having to resort to squeezing them out with your fingers! I bought the box the same day it released, and hoped that it would not contain the blackhead-scraper thingy. 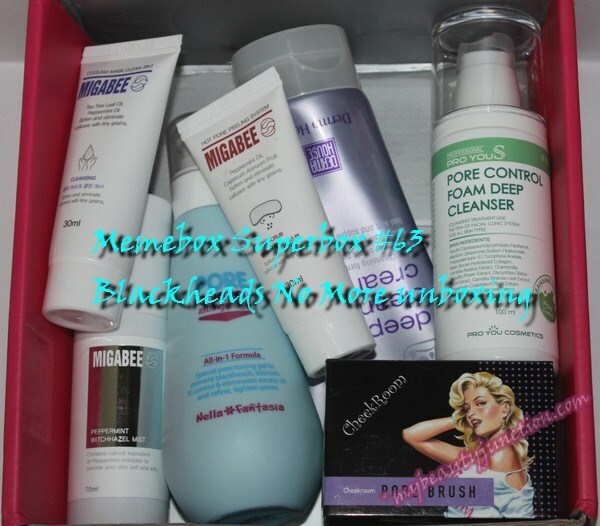 Read on for my review and unboxing of Memebox Superbox 63 Blackheads No More. There are six products in this Memebox. A quick look at each. This is a set of three products - first is a Hot Pore Peeling system, which heats the surface of the skin on contact, to unclog pores. Think of that steaming machine-thingy in salons. The second step is a Cooling Cleaning Mask, which serves as cleanser and mask to soothe the skin and to remove oil and impurities from the pores. Finally, we have the Peppermint Witchhazel Mist. I always thought Witchhazel was very drying, but my face is so oily that even Witchhazel has not had much of an effect. This is a great set for a home-facial and I am going to try it out over a weekend once I am feeling better. This is the sort of product I love seeing in Memeboxes! It took me a while to find out that toners and astringents were different. Either way, my derm has banned them both from my regimen because they tend to dry out my skin to flaking-point, so my skin produces even more oil to counteract. I prefer mattifying fluids such as the ones from Murad or Anthony Logistics or Paula's Choice. But I will give this a one-week trial and stop using it the moment I find the merest hint of dryness. Am I the only person for whom these nose strips *cough* don't really work? Or is it because I don't have blackheads and because I use a face scrub once or twice a week anyway? I must have used dozens of the things. They are fun, but they sit there twiddling their strip-thumbs (don't ask, blame the Fig Wine I bought from the mountain-trip) doing nothing on my nose. I gave a number of these strips away to my family and friends and they all swear that a good nose scrub does a better job. I have already given away these. 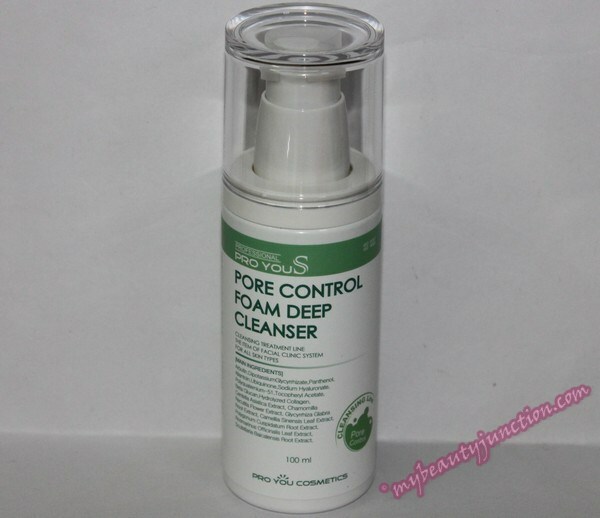 A pore-cleaning deep cleansing foam with oxygen, collagen and hyaluronic acid, this "bubbles up" on your face! I love trying out fun products like that, and you can never have too many face cleansers. Great choice. To be honest, this box contains more cleansers than the Cleansing box did! 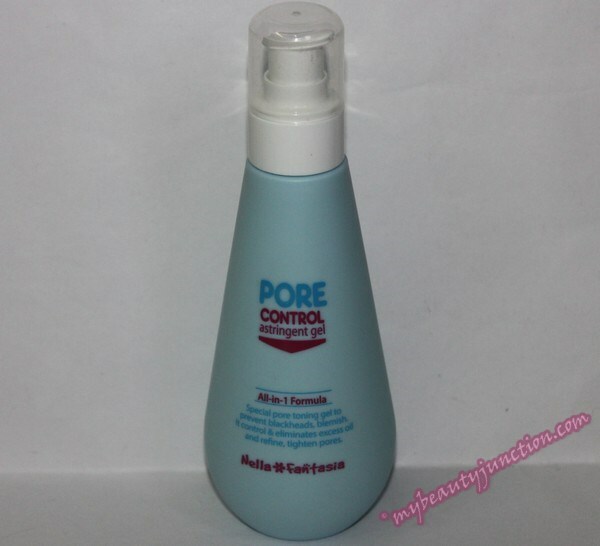 This is a one-step cleanser that removes makeup as well. It contains aloe vera, avocado oil, collagen and squalene. It has a mild formula. You use this before using a foam cleanser - Koreans have a three-step cleansing system involving cleansing oil, cream and foam in that order. I suppose squeaky clean skin is super-healthy skin. It certainly explains their lack of pimples and excellent complexions, so I am going to try out two- or three-step cleansing, with a makeup remover, a cleansing oil and a foam, from now on. Would you believe that I actually paid good money to buy this off Memebox's shop last month? And then, they go and send it out in a beauty box. The story of my life. 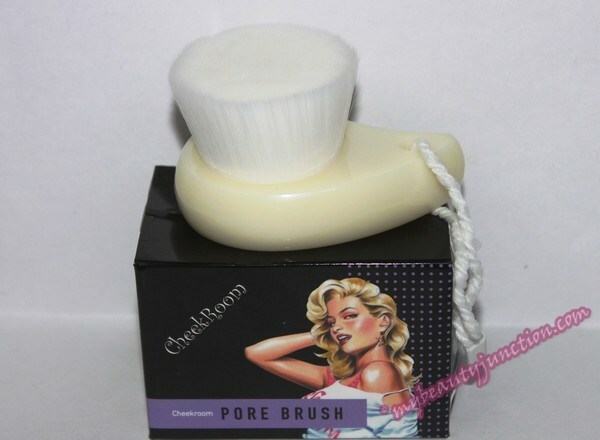 I use a pore brush or a muslin cloth or the konjac sponge or the Foreo Luna EACH TIME I cleanse my face now. This brush is super-soft and smooth. Like a smaller version of your dad's softest shaving brush. I used to love petting his shaving brushes. An aside: When my Dad's softest shaving brush disappeared, guess whom he suspected? 'Course he was justified! After a couple of meh boxes that I showed you last month - My Mask Box 5, Pinkaholic - I am glad to receive a good Memebox with Korean skin care products I really like. I love trying out cleansing products and can't ever seem to have enough, and this box is actually far better than the Cleansing Box, reviewed here. I love that there is a makeup removing cleansing cream, a foaming cleanser and a mini-facial kit. This box cost $39, which is a little more expensive than usual Memeboxes, but with a $5 off code and six full-sized products, of which I can use five, I think it was worth every penny. November has just begun, and do use codes E9RYOX or MN3Y95 when you buy your Memeboxes for $5 off your order of $30. You can use only one code. Check out all the Global boxes here, all the Superboxes here, all the Value Sets here and the Memeshop here - you need to take a gander at the Pony eyeshadow palette, launched yesterday! Cheerio!